Yippee, my first post in a long time! I actually made this card a few days before I was admitted to the hospital. 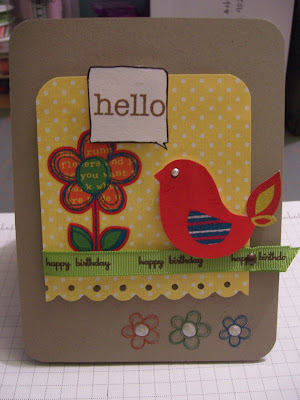 The card is made from kraft paper and rub-on images. I wanted to pop-up the image of the bird but it was a rub-on. I first applied the image on white cs and then I cut the image out. Liquid Pearls White Opal is what was used for the bird's eye and the centers of the flowers'. I forget what it's called but the "conversation window" stamped image is from 7Gypsies and I stamped the word hello inside. The image is cut out and popped up with foam dots. Luckily for me I had the perfect ribbon that said "Happy Birthday". 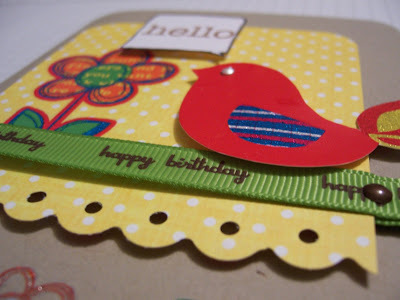 I then attached the ribbon to the card with a brown brad at the end to secure it. Ok that's it for now. I've been making cards and stuff here and there, now it's just up to me to upload them.